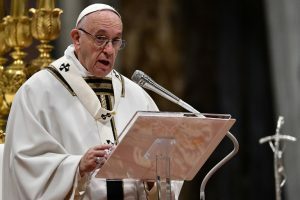 Spain’s Catholic Church wants to ‘eradicate’ cases of sexual abuse of minors within the church and not cover them up, the president of the Spanish bishops’ conference said Monday. As in other countries, Spain’s Catholic hierarchy is under pressure from local scandals and cases elsewhere that have seen critics accusing it of dragging its feet in delivering a response to abuse allegations. ‘The Church openly recognises cases of abuse of different nature and has taken the firm decision to eradicate them,’ Cardinal Ricardo Blazquez Perez of Valladolid, president of the Spanish bishops’ conference told a gathering of bishops in Madrid. ‘Abuse should not be covered up nor should it be met with the wrong answer,’ he added. Last week Father Jose Maria Gil Tamayo, the Spanish bishops’ conference secretary-general, said the Spanish Church had maintained a ‘complicit silence’ regarding abuse cases within a wider context of ‘inaction by all of Spanish society’, according to local media reports. Spain’s Catholic Church last month set up a commission charged with creating new rules to prevent child sexual abuse. The commission will also prepare for an unprecedented meeting of the heads of the national Catholic bishops’ conferences from around which Pope Francis has scheduled for February at the Vatican. Top-selling Spanish daily newspaper El Pais reported last month that Spain’s Catholic hierarchy silenced for decades the majority of cases of sexual abuse of minors within the church which it was aware of.